Opening in 1903, Hilltop Park became the New York Yankees first home. The team that moved into Hilltop Park was originally the Baltimore Orioles who played at Oriole Park. In 1902 the Orioles were sold to Joseph Gordon, Bill Devery, and Frank Farrell for $18,000. They decided to move the team to New York City to a site chosen near the Hudson River. Over $200,000 was spent excavating the site that the ballpark was built on because it was very rocky. Opening Day came on April 30, 1903 when the New York Highlanders played the Washington Senators. The ballpark was originally known as American League Park, but was renamed Hilltop Park soon after because the ballpark sat on high ground. However, the ballpark was not in good condition when it opened. There was a swamp in right field that had yet to be filled with rock, the outfield had no grass, the grandstand had not been completed, and players had to dress at their hotel rooms because the clubhouse was not completed. 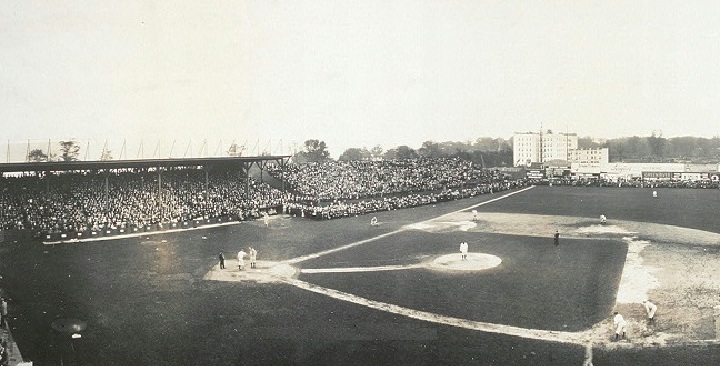 When Hilltop Park was finally completed, a single tier wooden covered grandstand extended from the third base dugout to homeplate and around to the first base dugout. Uncovered grandstands extended to both foul poles. From behind homeplate, fans could see scenic views of the Hudson River and New Jersey Palisades. After Polo Grounds burnt in 1911, the New York Giants moved into Hilltop Park. The next year, the Highlanders moved into a rebuilt Polo Grounds along with the Giants and were renamed the Yankees. The last game played at Hilltop Park was on October 5, 1912. Hilltop Park stood until 1914 when it was demolished. The site remained vacant until Columbia-Presbyterian Medical Center opened in 1928. –Location: Along 168th St., Fort Washington Ave, and 165th St. in Washington Heights of Manhattan.